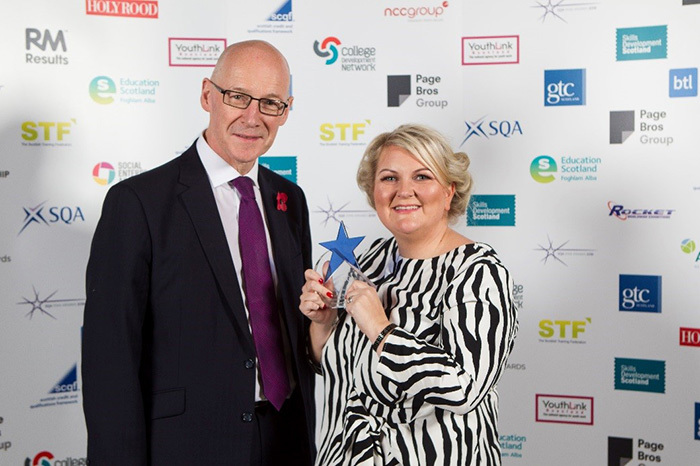 Pupils and students, teachers, lecturers, employers, and training providers from across Scotland and further afield gathered in Glasgow on Friday 09 November to hear a host of success stories at the 2018 Scottish Qualifications Authority Star Awards. 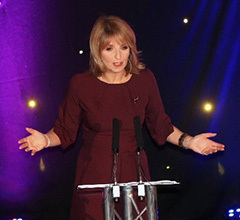 The ceremony, held in the city’s Kelvingrove Art Gallery and Museum, was hosted by TV and radio presenter Kaye Adams and with the support of a number of sponsors, including the General Teaching Council for Scotland, Skills Development Scotland, and the Scottish Credit and Qualifications Framework Partnership. The SQA Fellowship was presented to Lorna Trainer, Director of l&g learning. Lorna set up l&g learning in 2006 to provide flexible learning and development services, including Modern Apprenticeships and employability programmes. Lorna is also Vice Chair of the Scottish Training Federation; a member of the Federation of Small Businesses Scottish Policy Unit; and a member of the SQA Advisory Council. Lorna has acted as a consultant for NHS Education Scotland, SQA and the Scottish Social Services Council, developing SQA qualifications and National Occupational Standards, and contributing to policy initiatives. Student teacher Jonathan Marshall lifted SQA’s prestigious individual Pride o’ Worth Award, after earlier being named School Candidate of the Year. The judging panel recognised Jonathan’s outstanding bravery and determination to overcome significant health challenges, and his positive contribution to life at his former school, Clydeview Academy in Gourock. Not only did he excel at his SQA qualifications, Jonathan also achieved a Gold Duke of Edinburgh Award, participated regularly in school shows, and sang in the Inverclyde Youth Choir. He also managed to find time to mentor younger pupils at nearby Moorfoot Primary School. The programme removes them at fourth year from a disengaged school experience and provides a college curriculum pathway. This comes with a dedicated support worker and a mainly vocational, employment-focused learning programme. The programme has clearly improved attendance, and progression to employment or further study. Learners have the opportunity to engage with employers, and many also take part in volunteering and community engagement activities. 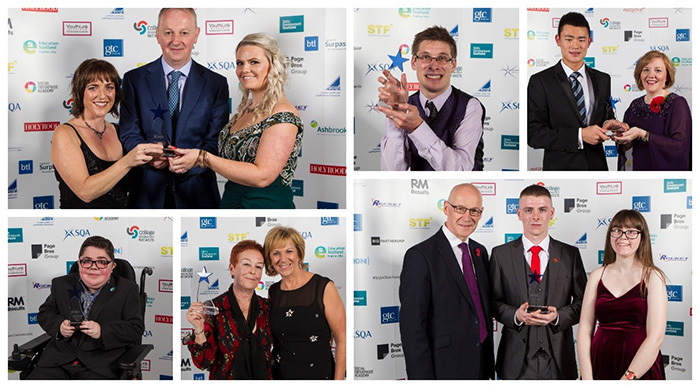 The SQA Star Awards - other winners on the night. The SQA Star Awards are unique, recognising both the individuals who work towards and the organisations that deliver SQA qualifications; rewarding those that have demonstrated an outstanding commitment to education and training. 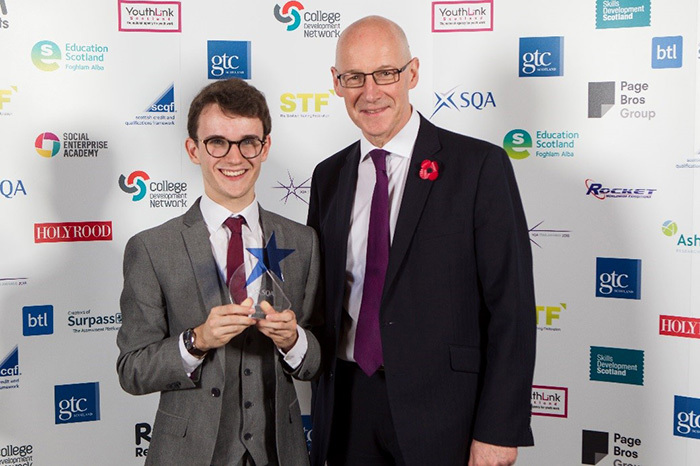 Jason McIlroy was named SQA’s inaugural Young Person of the Year, which is a special award marking the Year of Young People 2018. Other highlights include Ross Munro, who was named College Candidate of the Year. Lifting the Training Organisation Candidate of the Year was Callum MacDonald, whilst Lifelong Learning Candidate of the Year was named as Sharon Logan. Kirsten Amis and Ann Morgan-Thomas were named SQA Champion and Appointee of the Year respectively. Meanwhile, Timothy Chan scooped the Academic Excellence award. 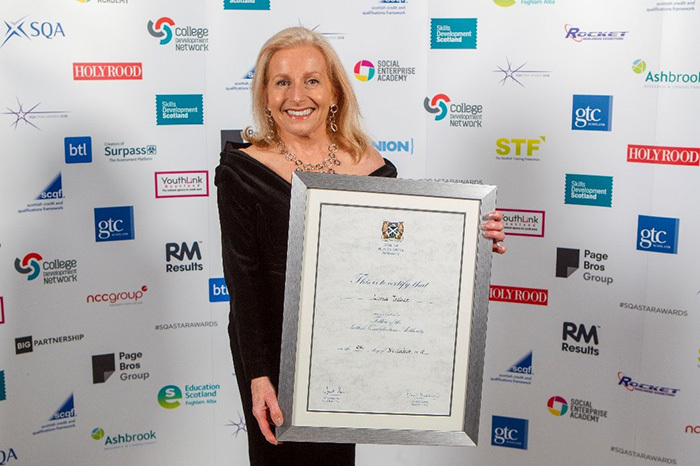 Community Learning and Development at Glasgow Clyde College was named Lifelong Learning Centre of the Year and Digital Mile at Dundee & Angus College came out top in the Partnership of the Year Category. Recognising SQA centres further afield, Saegis Campus in Sri Lanka lifted the International trophy, whilst the Thermal Insulation Contractors Association were named Centre of the Year in the Wider UK. Also announced as winners were the The Good Shepherd Centre, who were successful in the Innovation category. Entertaining our finalists and guests at the ceremony were talented young performers from Scotland’s schools and colleges. Annabel Thornett and Kieran Robertson, both HNC Music students at Ayrshire College, wowed the audience with their singing and guitar skills. Four musicians from Gleniffer High School in Renfrewshire impressed with their harp, fiddle, piano and accordion playing. 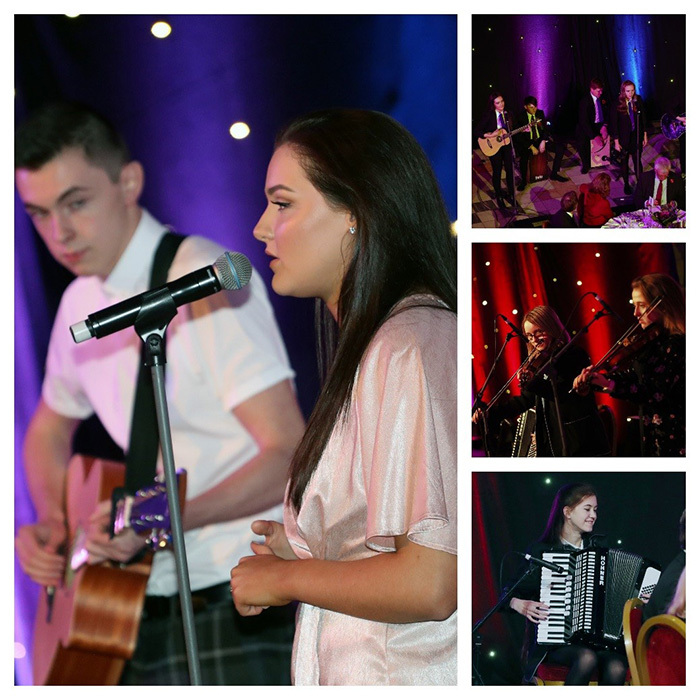 The Staves, a four piece band from Levenmouth Academy in Fife, treated the audience to a selection of original music.